Aside from mobilizing volunteer instructors to Nam Dinh Nursing University to teach, GVI also mobilized graduate students and faculty to the US for study tours. In 2014, Nam Dinh University opened the first clinical simulation lab in Vietnam. This simulation lab exhibits the physical transformation in Nam Dinh and serves as an ideal example of how GVI volunteers can use their profession and serve as catalyst for community development. This Stimulation Center will transform hundreds of nurses every year, who then use their skills to transfor millions of lives . The story behind this simulation lab is full of resilience, perseverance and creativity. Above all, it’s a story of a community taking charge to build a better future. 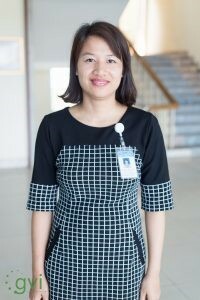 Follow us through an interview with Ms. Chinh, director of the simulation center in Nam Dinh Nursing University. Tell us about how this simulation lab started? The lab started as an idea in 2011. Our school wanted to create a facility to provide skill training for post-delivery care. We started out teaching skills and observing from recorded demos shown on a projector. In 2014, after working with the staff and faculty from Baylor University, we learned what clinical simulation is and the foundational knowledge and equipment needed to operate a simulation lab. A group of key staff was created to plan and build this simulation lab. With the support from GVI and Baylor University, we now have a simulation lab with 20 staff members. Before this simulation lab was established, what needs did you see as a medical instructor? We observed and realized a weakness in our students. Once our graduates started working in hospitals, they only knew to performing technical skills and failed to observe the patient’s expressions and feedback. Before the simulation lab, students learned as individuals. They would go into labs, practice their skills on mannequin models individually. For example, needle insertion was practiced on a mannequin or a model arm. This method did not provide any feedback for the student; they had no way of knowing if the procedure was incorrect or causing pain. We wanted our students to be proactive learners and change their attitude toward patients. It was difficult for students to associate a low fidelity mannequin with a real human being. When students worked with separated arms, legs, heads, they could learn how to insert a needle, but not how the patient is responding to said procedure. What were your reasons for building this simulation lab? We decided to open this center for two reasons. The first is to give students experiences and situations that are similar to the real environment they will operate in. Students will learn that they are caring for an entire human being, not just performing one technical skill or one part of the body. The second is to allow room for error. May the student fails to perform a procedure, due to whatever reason, they are not causing serious harm to an actual patient and affecting the healthcare quality in an actual hospital. During this journey, what were some obstacles you faced and how did you overcome them? Since we have never had a simulation lab before, we did not have a management model to derive from and we decided to create our own. We wrote a guide book for simulation to provide instructors with guidelines on what a simulation session is, what steps and preparation are needed. These guidelines were provided by Baylor instructors, but since simulation is brand new in Vietnam, we made adjustments to fit these guidelines into the local context. The next step was creating scenarios. We developed our first scenario, tested it with a group of instructors, sat down together and provided feedback on how to move forward. For this first scenario, we duplicated a scenario provided by Baylor University and found out that such scenario was not compatible in Vietnam and did not closely reflect the real world environment for future nurses. We made adjustments and ran the adjusted scenario with a group of students. I treasure the precious memories from this first simulation. The students were lost as they walked into the lab, even after we have instructed them on their roles and responsibilities. A patient model started screaming and the students simply did not know what to do and they froze. We realized that these students, unlike instructors, had absolutely no idea what clinical simulation was. We made more adjustments to fit our students and our classes. This was when we realized that we needed at least two instructors, one to explain and teach the students and another to control the technical simulation. Small things such as recreating a wound was a learning experience for us! Our female staff used makeup, lipsticks and our creativity to recreate a wound but it did not look real. We consulted Google and learned that we need specific materials, and we have since built up our materials. The models required a learning curve as well. The first models couldn’t talk or show expressions as a real person, but they did provide feedback in numbers and ratios. Students had a way of knowing what they did was right or wrong. But these were still individual models, the students did not see the consequence of their actions, such as putting too much pressure on the heart and killing a patient. We provided this kind of feedback with instructors acting as family members and yelling at the students “What did you do? My husband turned purple and now he is dead!” These practices and experiences gave the students a clear look at their responsibilities as nurses. Let’s talk a little bit about our volunteers from Baylor University. What else have these instructors bring with them other than academic and professional expertise? They brought a lot. They have changed the learning dynamic in our school. Our students used to be very passive learners; they would only receive information from instructors. But since Baylor instructors had been here, our students and even instructors have changed. Our view on the current teaching methods changed. We now have a mutually respectful relationship in which the student and the teacher are equal. The cultural exchange was also another benefit. Our own instructors have overcome their initial shyness working with foreign coworkers. The American instructors on the other hand have understood the Vietnamese culture and the relationships between students and teachers. Over the past years, how have our volunteers (instructors) help your school? Honestly, everything GVI and Baylor have done to support us exceeded our expectations. For example, we had absolutely no clue what simulation was before, and after these instructors came and passionately worked with us, we realized the importance of simulation and when we proposed the simulation lab, the idea received tremendous support from our school. I’m not saying this to give these instructors a pat in the back, but the reality is they have brought light to people in this this corner of the world. All the amazing transformation in the past years would not be possible without GVI and their volunteers. In the future, how do you plan to develop this simulation lab? How can we help you reach your goal? First is human resources. We would like to have more training on the management, organization, and practicing simulation. We could learn a great deal from having instructors from other schools here or sending our instructors overseas on a study tour. Second, our current staff lacks experience in simulation. They understand the concept of simulation but have never had any experience within an actual lab. We hope to have a group of experts to show us the actual simulation in the lab setting in Vietnam. We can use the feedback from these experts to find out how we can make this lab most effective. Thank you for your time and dedication to this project, we hope the best for the Stimulation Center and your school! The Stimulation Center at Nam Dinh Nursing University is the largest stimulation lab in Vietnam (in terms of scale). The Stimulation Center received tremendously positive feedback from nursing students. They love the experience and a lot of them ask to stay overtime in the lab. For the first time, these students had the opportunity to learn together and teach one another. “They [the students] remind me of the first group of instructors visiting the stimulation lab at Baylor for the first time, how we froze on our feet and how we panicked with added pressure.” – A professor at Nam Dinh Nursing University. Older Post5 Unconventional ways to stay warm this winter.